Wrigley Field from a Sheffield Ave. rooftop. GTJ Photo. Maybe you'll be able to schedule one of the following visits. Check the calendar and call ahead. The rooftops across from Wrigley Field are unique in U.S. sports. 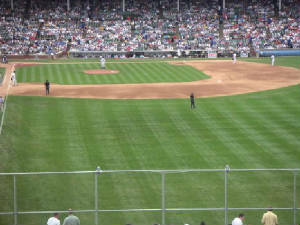 The baseball park is located in a neighborhood, now called Wrigleyville, that was built around the turn of the 19th-20th centuries. As you can see from the photo above, the views are wonderful. The rooftop spectators have a sense of being both in an old Chicago neighborhood and in the park at the same time. Most days, the rooftops are reserved for groups, but sometimes there are individual tickets. You can contact the rooftop owners that cooperate with the Chicago Cubs through the Cubs ticket office or by viewing this website: Rooftops. If you are in town when the Chicago History Museum offers one of its historical tours, by all means take it. You will enjoy the train tours of elevated train lines. The bus tour is a great way to visit Bronzville, the African-American community that is rich in history and is now reinventing itself as an historic site. There also are neighborhood walking tours. Holy Trinity Russian Orthodox Cathedral is a unique project by Louis Sullivan, one that is unknown to most Chicagoans. My experience is that it is almost never open to the public, but I have managed to visit it a few times. I suggest that you telephone the cathedral at 773.486.6064 and see whether you can arrange a visit. Even if the cathedral is not open, it still is worth viewing the exterior of the building. The address is 1121 N. Leavitt St. in the Ukrainian Village neighborhood. Look around that very interesting neighborhood, and seek out a Ukrainian restaurant for lunch. If you are in town on any March 13, then come to Jackson Park, south of the Museum of Science and Industry, for one of Chicago's most unique events. This is the annual gathering of an informal group of admirers of Clarence Darrow. This famous lawyer told his friends that if an afterlife existed, he would return at 10:00 am on the anniversary of the day of his death in 1938 to his favorite place in Jackson Park, where there is now a bridge named after him. Admirers of Darrow still gather as requested, but there has been no official contact. Every year, they throw a wreath into the lagoon, where Darrow's ashes were scattered. Darrow Commemoration. 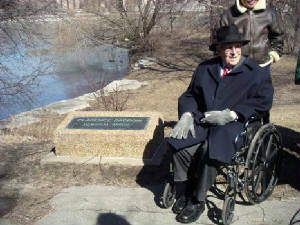 Leon Despres, who knew Darrow, at an annual commemoration. GTJ Photo.